At Prince George’s Animal Hospital near Lanham - Seabrook, New Carrollton, Landover Hills and Silver Spring, MD, we provide a variety of exceptional veterinary services for our patients. We invite you to select the service you are interested in to learn more about it. If you still have questions after exploring this page, please contact our team. We would love to help! The team at Prince George’s Animal Hospital can help you if your pet is displaying behavioral concerns, such as disobedience, aggression, and other inappropriate behavior. The first step in treating a behavioral issue is making a diagnosis, ruling out any potential health problems that may be the cause. Once health problems have been identified or eliminated, we will help you tackle the behavioral issue through appropriate training techniques. We provide daycare and lodging services to both dogs and cats at Prince George’s Animal Hospital. We have large indoor kennels for our larger canine guests, smaller cages for smaller canines, and a completely separate cat ward for our feline guests. Dogs are walked or taken out to play and for potty three times a day. We provide everything for your pet’s needs, from food—including a high quality diet called E/N that is easy on the digestive tract —to bedding and dishes, but please feel free to bring your pet’s food, blanket, or toy from home if it makes them feel more comfortable. Be sure to label your pet’s items clearly with their first and last name. If your pet requires medications, please bring those as well. When making reservations for your pet, we recommend scheduling a week in advance, as we book up quickly. Excellent oral health is one of the most important parts of a pet’s overall physical health. We perform routine dental checks during all of our physical examinations, often prescribing professional dental cleanings as a result. Professional dental cleanings, which are performed under anesthesia, include pre-anesthetic blood work, complete surgical monitoring, cleaning, scaling, and polishing. At-home dental care is essential for oral health maintenance. We provide a variety of dental care products from CET including chews, sprays, water additives, treats, toothbrushes, and toothpaste. We also provide Science Diet dental diets. These products can help to ensure that your pet’s oral health is maintained between professional cleanings. The team at Prince George’s Animal Hospital provides a wide variety of diagnostic services, allowing us to diagnose a variety of health conditions quickly and efficiently. We have an in-house laboratory, radiology, and capabilities of providing Penn Hip analyses. We understand that end of life decisions are some of the hardest choices to make in your pet’s life. The team at Prince George’s Animal Hospital is here for you during this difficult time. We provide compassionate services for geriatric patients, including at-home care on certain occasions. We would be glad to talk with you about your options. Please contact our team. At Prince George’s Animal Hospital, we provide life stage specific health care for our patients. We provide annual physical examinations for adult pets and bi-annual exams for pets over the age of 7. During these annual visits, we perform complete nose-to-tail checks, diagnostic testing if prescribed, necessary vaccinations, dental checks, and more. Pet medical care is one of the most important services we offer at Prince George’s Animal Hospital. We provide medical care for pets that are exhibiting a variety of symptoms from vomiting, diarrhea, rashes, ear infections, pain, and more. Please contact us if you observe any of these symptoms and schedule a visit for your pet. Prescription diets are an excellent way to provide your pet with the medications they need for their health. We provide a variety of prescription diet options for pets with specific health conditions, including allergies, digestive disorders, and arthritis, just to name a few. We also provide weight maintenance diets for pets that have difficulty with weight management. We would be happy to discuss your pet’s dietary options with you. Our fully-stocked, in-house pharmacy enables the convenience of prescription filling on-the-spot so that you do not need to wait to begin your pet’s treatment! Pet surgery is an important aspect of complete veterinary care. Our surgeries are safe, utilizing complete surgical monitoring techniques throughout the entire procedure. We perform a variety of surgeries, from basic surgeries such as spay and neuter, to more complex procedures. Prince George’s Animal Hospital was designed to accommodate the needs of our patients as effectively and efficiently as possible. Our facilities are equipped with the most up-to-date laboratory equipment and digital radiography for diagnostics, so you can get your pet’s results faster. If your pet is ever in need of an emergency blood transfusion, it can be performed immediately in our laboratory. We also have surgical ward where we can perform both minor and major surgeries with the availability of board-certified surgeon for more complex procedures. To view our practice, please view our photo gallery. 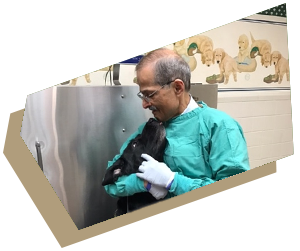 Dr. Khianey and the other doctors of Prince George’s Animal Hospital have been the primary veterinarians for bomb-sniffing dogs, funded by Homeland Security, for over 10 years. Bomb-sniffing dogs, also known as detection dogs, are trained to discern individual scents, with 20-40 more times the number of odor receptors as humans. Bomb-sniffing dogs are used for many different events and venues, including airports; major events where thousands of people are present, such as the Olympic Games; presidential events; and U.S. Customs and Border Protection. These dogs are trained to save lives, so it’s important that they receive high-quality veterinary care, and we are proud to provide that for them every year.